The Detarieae sens. lat. is pantropical in distribution and consists of 82 genera and c. 750 species, with the majority of genera confined to Africa and Madagascar (Mackinder, 2005). This group is known for its remarkable range and complex patterns of floral modifications. Of special interest, the World Conservation Union has assessed at least 132 extant species of Detarieae for red data status, 13 of which are considered endangered, 11 are critically endangered, and 73 are near endangered or vulnerable (Mackinder, 2005). Species in Detarieae demonstrate co-adaptation with animals for defensive and reproductive purposes. 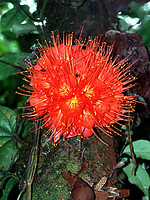 They have adapted flower shape and coloration to attract bees for pollination, and some have leaves that attract ants. Other distinguishing characteristics include the production of tannins and terpenoids (Cowan and Polhill, 1981). Detarieae sens. lat. also includes a number of resin-producing genera (Fougere-Danezan et al., 2003). Detarieae sens. lat. (sensu Polhill, 1994) includes the tribes Detarieae DC. and Amherstieae Bentham. The range and complexity of morphological variation, especially floral modifications, exhibited in the tribe have proven problematic to the establishment of clearly circumscribed and accepted generic groupings (Mackinder, 2005). Phylogenies based on morphological characteristics and molecular genetic studies exist, but extreme diversity among species makes determining relationships between them difficult. The African species are the primary focus of study within the tribe, other species and their classification are less well known. The first 'comprehensive' studies of phylogenetic relationships, based on molecular sequence data, were those of Bruneau et al. (2000, 2001) which suggested that none of the proposed generic groups (e.g., Cowan and Polhill, 1981; Polhill, 1994) were strongly supported as monophyletic. More recent analyses of molecular data alone and combined molecular and morphological data (Herendeen et al., 2003; Wieringa and Gervais, 2003) have provided additional resolution and support for some groups. For example, the 'Prioria' (sensu Bruneau et al., 2001), Detarieae sens. strict., and 'Amherstieae' subclades are well-supported but unresolved with respect to each other. The Amherstieae clade contains the 'Brownea' and Macrolobieae subclades (sensu Bruneau et al., 2001), with the latter containing a number of familiar genera such as Berlinia, Aphanocalyx, Bikinia, and Tetraberlinia. 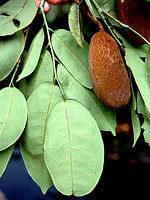 Tamarindus, the tamarind-producing plant, is also included in Amherstieae. Bruneau, A., F. J. Breteler, J. J. Weiringa, G. Y. F. Gervais, and F. Forest. 2000. Phylogenetic relationships in tribes Macrolobieae and Detarieae as inferred from chloroplast trnL intron sequences. Pages 121-149 in Advances in Legume Systematics, part 9 (P.S. Herendeen and A. Bruneau, eds.). Royal Botanic Gardens, Kew, UK. Cowan, R. S. and R. M. Polhill. 1981. Detarieae. Pages 117-134 in Advances in Legume Systematics, part 1 (R. M Polhill and P. H. Raven, eds.). Royal Botanic Gardens, Kew, UK. Fougere-Danezan, M., S. Maumont, and A. Bruneau. 2003. Phylogenetic relationships in the resin-producing Detarieae inferred from molecular data and preliminary results from a biogeographic hypothesis. Pages 161-180 in Advances in Legume Systematics, part 10, higher level systematics (B.B. Klitgaard and A. Bruneau, eds.). Royal Botanic Gardens, Kew, UK. Mackinder, B. 2005. Detarieae. Pages 69-109 Legumes of the world (Lewis, G., B. Schrire, B. MacKinder, and M. Lock, eds.). The Royal Botanical Gardens, Kew, UK. Polhill, R. M. 1994. Classification of the Leguminosae. Pages xxxv-xlviii in Phytochemical Dictionary of the Leguminosae (F. A. Bisby, J. Buckingham, and J. B. Harborne, eds.). Chapman and Hall, New York, NY. Wieringa, J. J., and G. Y. F. Gervais. 2003. 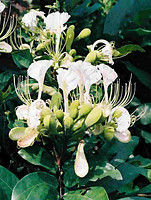 Phylogenetic analysis of combined morphological and molecular data sets on the Aphanocalyx-Bikinia-Tetraberlinia group (Leguminosae, Caesalpinioideae, Detarieae s.l.). Pages 181-196 in Advances in Legume Systematics, part 10, higher level systematics (B. B. Klitgaard and A. Bruneau, eds.). Royal Botanic Gardens, Kew, UK. 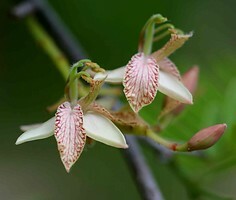 Berlinia bruneelii (De Wild.) Torr. & Hillc.